Difference in function does not indicate inferiority of nature. For many who deny the Trinity or the deity of Jesus, it is thought that since Jesus fulfilled a lesser (subordinate) role in his incarnation compared to that of the Father, Jesus must therefore posses a lesser nature. Those who oppose the deity of Christ often point to Jesus’ submissive remarks about doing the will of his Father. For example, Jesus says, “the Father is greater than I am.” They infer from this that Jesus does not share the same nature with the Father. But this is confusing categories. It ignores the broader context that is talking about their relational roles, not their nature. Jesus also calls the Father, “My God.” Yet those who oppose the deity of Christ ignore that this is a humble acknowledgment of the incarnate Jesus modeling for us humility and submissiveness (John 20:17). This exalting-affirmation is what we would expect from the Son of God. Similarly, it is argued, since Jesus is the agent of the Father in many respects such as creation, Jesus cannot be fully God. Regarding the Spirit, they will make the similar false assumption. Since the Spirit is sent by the Father, the Spirit cannot have the same divine nature as the Father. They will look at these statements and make the fallacious leap that difference in function indicates inferiority of nature. They also deny the freedom of the Divine persons to choose their roles. Or to put it another way: they assume that to be truly God, the Son and the Spirit must have the exact same roles as the Father in order to share in the same nature. A simple, but effective, illustration will show that difference in function does not indicate inferiority of nature: A husband and wife—as well as children!—will posses different roles in a marriage. Wives are to take on the submissive role, yet this does not indicate that difference in function requires inferiority of nature. Does the wife have a lesser nature than that of the husband? Not according to Christian anthropology. They are both fully human. Let’s praise God for the incarnation, which itself presupposes a submissive role that brought about our salvation. 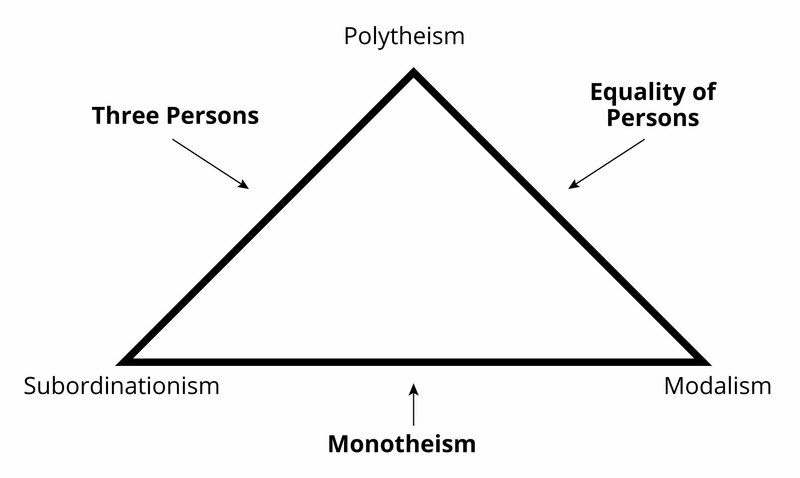 We do not worship a unipersonal-unitarian God, but worship instead a complementary-trinitarian God.